It is officially Autumn and I am just itching to start crocheting hats and scarves! Some of my favorite hats to crochet are slouch beanies because they fit loosely on the head, and I can’t stand a hat that smooshes my hair down. With the Gail Slouch Beanie, the fit is just right. (And if you want a different size than suggested, look on down for instructions on how to adjust the size of your beanie). First you will crochet the ribbing in rows and then turn the hat to work the body, which is made of alternating puff stitches. 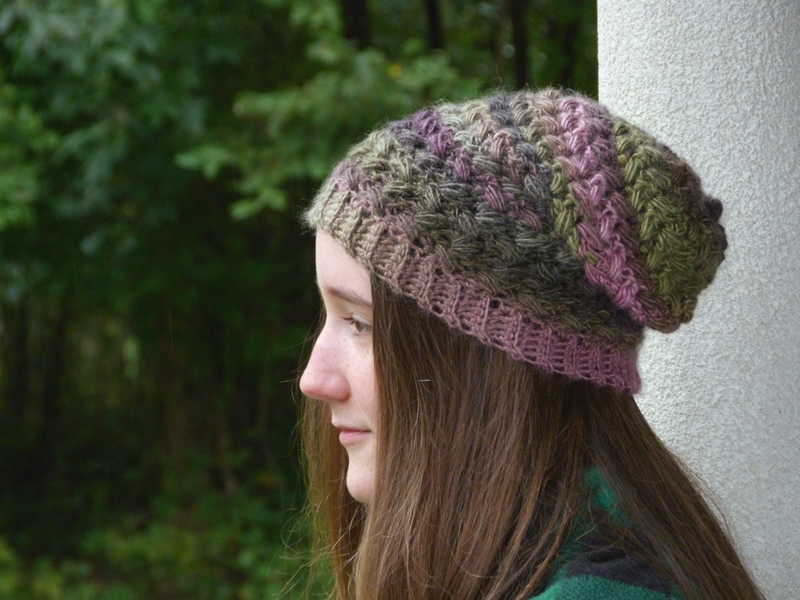 Though the hat may look complicated, it really is quite simple and crochets with ease. Give the Gail Slouch Beanie a try and let me know what you think! Gauge Swatch: 1’’w x 1’’h (2.5 cm x 2.5 cm) ch 4. To alter hat size, simply add or subtract a multiple of 3 rows from the ribbing and continue pattern instructions. Do not finish off, hold ends together and sc across to join ends. Note: The stitch count on rounds 13 – 16 deceases by 1 puff stitch on each round. After round 16, there will be 16 puff stitches. Flip beanie inside out. With a long strand of yarn and a yarn needle, make a running stitch along Round 17. Pull yarn to gather hat tight and stitch closed. Flip hat back right side out. Be sure to leave a comment if you have any questions or thoughts! This entry was posted on Monday, October 1st, 2018 at 9:16 AM by Amy	and is filed under Free Crochet Patterns. You can follow any responses to this entry through the RSS 2.0 feed. You can skip to the end and leave a response. Pinging is currently not allowed. What a beautiful pattern, Amy!